Is it a bad idea to mount a MLOK QD socket on magpul 590 forend? Set up is 590 14” SBS w/ Salvo 12. My concern is the weight of the gun held only by the action bars causing problems long term. I know there are other better ways to mount a sling on a shotgun and I have a GG&G front ambi Hk style sling plate but the problem is the interference with the light that rides up on the left side of the slide action, requirement is for ambi slinged use (shared by both right and left handed shooters). I don’t like the idea of the sling changing positions as you work the action. If it’s tight with the action closed it’s lose with the action open. If it’s tight with the action open, it may prevent the action from closing. Assuming you can't use a mag cap sling mount due to the suppressor? Good point, I would guess this is why I have never seen sling mounts on the pump forearm before, a non-starter for a life support gun. This gun is flexible though, its purpose is critter control with subsonic birdshot walking around several achers of wooded nehborhood property. Still it sounds like a point of frustration. problem though is the sling running into the light mounted on the action forened 3 or 9 o’clock mlok slots when used by the shooter handed same as the side the light is on (HL-X). I could bottom mount the light at 6 o’clock but the shadow the salvo 12 casts is huge and upward into your sight line (most the critter gettin happens at night). Would need like an 10” canteliever mount at 6 o’clock. The cap might just work if I can get the light higher on the forend so as to ride over the top of the sling. Maybe this cap mount and the new Arisaka MLOk side mount or a IWC canteliever scout mount would do it? hopefully without obscuring to much view when sighted. I used the Magpul mag tube clamp for sling mounting on mine. Based on using it on an 870 with a Magpul forearm and 9 o'clock cantilever light I am fairly sure this will work. The 14” front end doesn’t have any tube space forward of the pump and behind the muzzle to work with tube clamps. Thanks I am going to try a QD socket mag tube cap. I also found out the old style HK snap hook rings https://www.opticsplanet.com/gg-g-mo...ttachment.html do not allow full range of motion with magpul’s paraclips https://www.opticsplanet.com/magpul-paraclip.html. The rear receiver plate from GG&G is too thick even for the magpul paraclips to even close on: https://www.opticsplanet.com/gg-g-mo...nt-looped.html so I ditched the reciever plate and went with QD sockets at the rear in the stock. I suppose in worst case scenario with the sling and light configuration at the front I’ll just run the rig single point at the back. release myself from the sling for some reason. This removes the light obstruction and provides a good sling point. 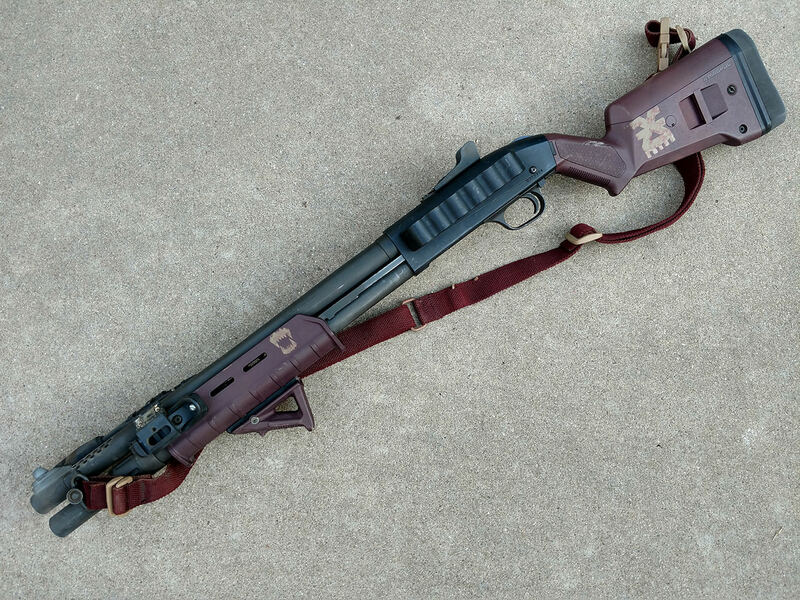 The only downside to this is that I would need to have a dedicated sling for my shotgun rather than quickly switching it between platforms. Not sure about the 590, but there is a video of a guy with the Magpul forend and a Wilson combat mag tube extension without the sling attachment. If you look, the sling attachment is just forward of the collar and so it seems it will clear. Good question though. Here's the mag tube extension for reference. And here's a video that you can see the extension with the forend. Last edited by jaramillo4418; 02-10-19 at 20:18.